Like I mentioned last time, we're always reading something different outloud and this changes on a day-to-day basis. I'm going to get to the "Read Aloud" part of this post, but first I'm going to focus on the "say aloud" part. Lately I've been more convicted about memorizing stories that I can tell my son (and future children!) right "off the top of my head." Currently I'm not creative enough to make up stories on the fly. Maybe one day I'll be able to do that. One of my fondest memories growing up is having my dad "tell me a silly story!" before konking out for the night. It's a goal I aim for. In the meantime, I've been brushing up on childhood fairy tales so that I can tell my son a story without having to hold a book in my hands! However, then there's the fact that my son is only two and his attention span is quite short. He's not quite ready to sit and listen to mommy go on and on in telling him a story. 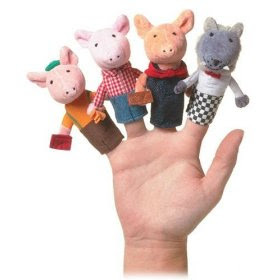 With the aid of these Storytime Three Little Pigs finger puppets though he does just great! These finger puppets are produced by Manhattan Toy and they have a whole line of cute finger puppets. My sons eyes lit up when he saw these and he let me tell him the story of The Three Little Pigs over and over again. I have to say I really am impressed with the quality of these finger puppets. Each of the pigs hold the item which they constructed their personal home with (i.e., one is holding a piece of hay, one a stick and one a brick). The wolf is fierce, but not scary. (That's important in our house!) Manhattan Toy has really produced some quality story telling materials with their puppets and I think they are worth checking out. Lastly, (since this is a Read Aloud post!) 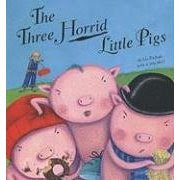 we read The Three Horrid Little Pigs (published by Tiger Tales. In this retelling by the "very nice" Liz Pichon, the three little pigs are so horrid that they drive their mother plum crazy. Mother pig shoos them off to build their own homes where they revel in their laziness and build ridiculously unstable homes. In this story, the wolf is actually quite nice and comes along to help them build more stable homes but the pigs will have none of it and threaten to "huff and puff and blow him out" if he comes into their homes. In the end, the wolf builds the only solid home and welcomes the pigs shelter when their own pieces of sticks and hay fall apart. He feeds them soup and offers them hospitality. The pigs "repent" of their lazy ways and help the wolf build a big, strong home that is "big enough for everyone!" If you like a happy ending to your tales, this is a unique spin off. I'm still looking for a picture book that I like that tells the traditional story but I haven't found one yet. For now, I must go from memory, finger puppet story telling, and use the "reward" of Disney to tell the story in its original form. So what about you? What are you reading aloud (to yourself or to your kiddoes) these days? You still have time to participate in Amy's weekly Read Aloud Thursday carnival. If you do - leave a note and I'll go visit you also! I'm always looking for new ideas of things to read with my young'un so if nothing else, leave a comment and share! I may probably will take your advice! I've seen these at a local education/teacher supply store. Very cute! Disney has a great picture book of the 3 Little Pigs. It's basically the movie in book form. I don't know if they still sell it. Our version is the one I used as a child.